Photograph taken 9th June 2000 just after it ceased to be a place of worship. 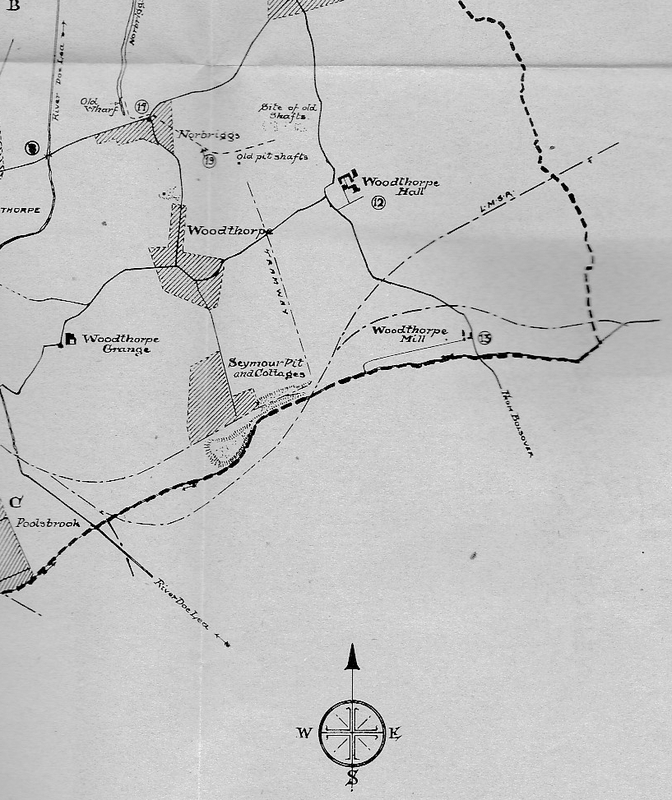 Ordnance Survey Map circa 1900. National Library of Scotland. Opens in a new window. Woodthorpe area map from the above book. Published in 1948. Now sadly out of print but most librarys have a copy. 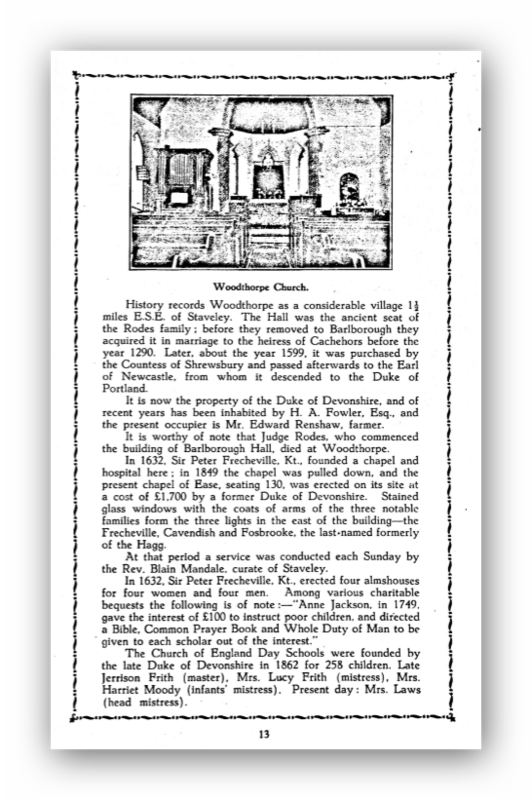 Article on the Church is from a Staveley Saint John Baptist Church 'Annual Bazaar, Official Handbook, November 3rd. & 4th. 1936'. 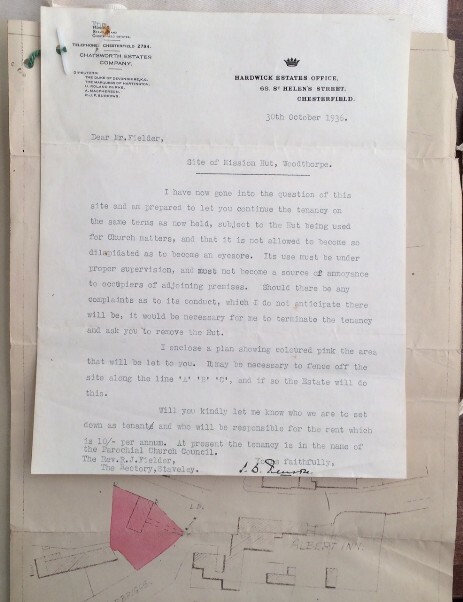 (Derbyshire Records Office). (Present Owner). 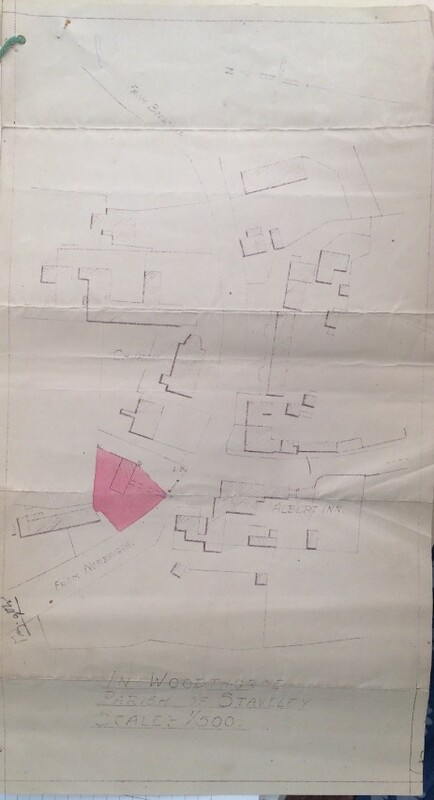 A plan from 1936 from the Hardwick Estates Office regarding the rent of the Mission Building of the Church. See attached a picture of the now restored 'Guild Of Ascension'...located in the Eastern end of the Church on one side of the Chancel. When we bought the property this was painted in some kind of emulsion and a bit of a mess. I stripped this off, including the old paint in the letters and repainted them. I also cleaned the Marble with a very very fine abrasive paper. It's taken quite a lot of time. T.P. Woods Almanacs 1920 to 1962. 1920. Parochial Lay Reader Mr. A.E. Jones. Secretary Mr. F. Knight. Treasurer Mr. J. Fletcher. Organist Mr. J. Moody. Assistant Mr. F. Knight. 1927. Parochial Lay Reader Mr. A.E. Jones. Secretary Mr. F. Knight. Treasurer Mr. J. Fletcher. Organist Mr. J. Moody. 1928. Parochial Lay Reader Mr. A.E. Jones. Secretary Mr. F. Knight. Treasurer Mr. J. Fletcher. Organist Mr. J. Moody. 1933. Rev. P.B.H. Kirkby. Treasurer. Mr.G. Denman. 1934. Rev. P.B.H. Kirkby. Treasurer. Mr.G. Denman. 1936. In Charge the Rev. J. Fielden. Treasurer. Mr.G. Denman. 1939. In Charge the Rev. J.H.L. Waterson. Treasurer Mr. W.S. Ewart. Secretary Mr. M.J. Laws. 1940. In Charge the Rev. I. Carrick. Treasurer Mr. W.S. Ewart. Secretary Mr. M.J. Laws. 1958. In Charge the Rev. F.G. Phipps. 1959. In Charge the Rev. F.G. Phipps. 1960. In Charge the Rev. F.G. Phipps. 1961. Rev. D.C. Gooderham. He is also at Mastin Moor. 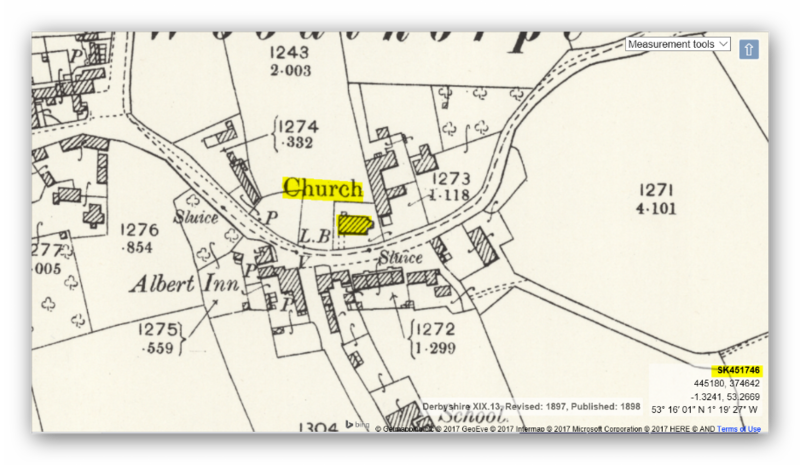 Poolsbrook & Staveley Churches. 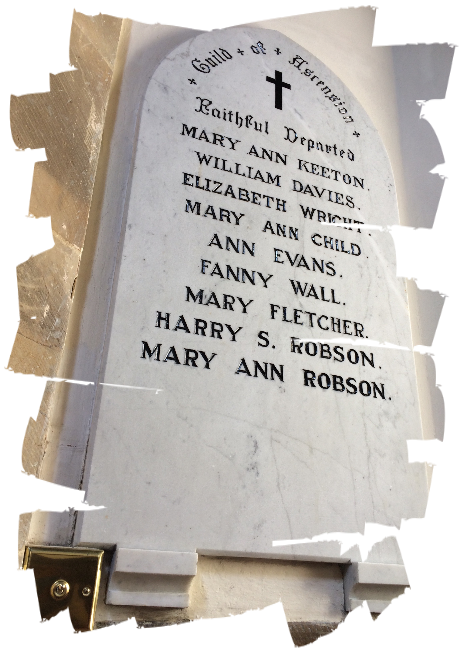 Also other religious functions within the Staveley Parish Church remit. 1962. Rev. R.D. Jenkins. He is also at Mastin Moor. Poolsbrook & Staveley Churches. 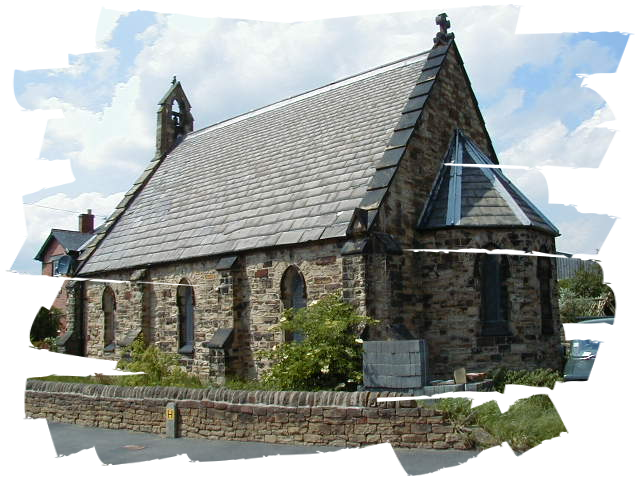 Also other religious functions within the Staveley Parish Church remit. 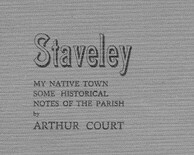 No further Staveley information from 1962 onwards.